Use this XO Baking flour cup-for-cup in any recipe and you’ll never know it was gluten free! The special blend of gluten free flours is the base for the most delicious, amazing textured baked goods, both savory and sweet. I used it in some of my favorite recipes and had great results. 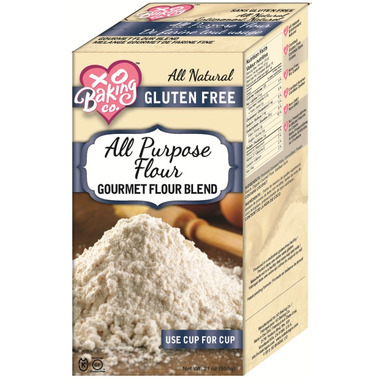 By far some of the best gluten free flour I have tried. The best gluten free substitute we have found so far for cookies, bars and the like. Will definitely keep buying it. WOW! This flour is amazing. You can truly use it cup for cup to replace wheat flour. Love that it's rice, soy, wheat and gluten free too. I follow a mostly paleo diet and it's hard to find cassava flour in Canada, SO happy that's what this company uses, it's fantastic! Great, simple ingredients. Highly recommended!! !